Easy to install, simple to manage Plug in your Ethernet cable, mouse, keyboard, and monitor. Install the included vSpace desktop virtualization software on the shared PC. It just takes a few minutes. You have now added multiple users, each with their own rich Windows environment. Best of all, you can run standard applications and your staff and users won’t need any special training. Powerful and flexible The L250 features a compact design, a stereo jack, a microphone jack, one USB 2.0 remote port and video resolutions up to 1400x900 for wide screens and 1280x1024 for standard 4:3 screens, all with 16-bit or 24-bit color support. vSpace virtualization software—get more from your VDI investment NComputing vSpace Server enables enterprises to optimize virtual desktop deployments by providing multiple end users with simultaneous access to a single operating system instance of Windows. vSpace not only integrates into virtualization server deployments based on VMware, Citrix and Microsoft offerings, but can also extend their value by changing the typical virtual desktop structure from one user per virtual machine to 100 users per virtual machine. This has a direct, positive impact on operational expenses and immediately lowers overall desktop PC costs such as support, maintenance, and desktop replacement. The L300 access device—next-generation media acceleration With the L300, watching DVD-quality video on up to a 1920x1080 display comes standard for most common media formats. The game-changing access device comes packaged in a sleek lowpower package that can be easily mounted on a monitor or secured to a desk. 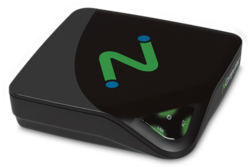 Powered by a new NComputing Numo System-on-Chip (SoC), the L300 uses patent-pending hardware technology to decode and scale multimedia locally, eliminating network strain. The L300 access device costs less than any other thin- or zero-client options and a quarter of the cost of desktop PCs. 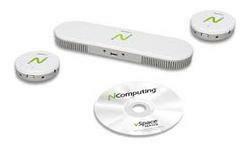 In combination with the NComputing vSpace Server, it enables VDI solutions at one-third the price of traditional offerings. RX-series: RX300 Cloud-Ready Thin Client for Windows® NComputing has delivered more than 3 million low-cost thin clients worldwide. Our latest, the RX300, is built for productivity using the latest Raspberry Pi 3 platform. Designed and optimized specifically for NComputing’s award-winning vSpace Pro desktop virtualization solution, the RX300 is cloud-ready and provides a rich PC-like experience. RX300 features full-screen, full-motion HD multimedia playback with vCAST direct streaming technology support, built-in transparent USB redirection achieving unparalleled peripheral support, WiFi, and optional access to Raspbian Linux OS managed by the IT admin. The RX300 provides a simple-todeploy, centrally managed, high performance virtual desktop, perfect for use in SMB and education. Cloud-ready with vCAST streaming support vCAST, a technology included in vSpace Pro, reduces the overall server-side CPU usage for web videos like YouTube or local media content without the need for expensive GPUs. This allows for higher quality media streaming utilizing the network bandwidth without server CPU bottlenecks, thereby supporting more concurrent users per server. Dual mode support – enhanced productivity and flexibility RX300 comes equipped with both a ‘Thin Client Mode’ and ‘Raspbian Linux Mode.’ Use the RX300 as a locked down thin client with connections to vSpace Pro and Verde VDI, or as a Raspberry Pi 3 device allowing direct access to Raspbian Linux OS and its popular games (Minecraft), how-to-code applications (Scratch, Python and Java) and productivity tools. Central management & express deployment The RX300 is easy to configure and automatically receives updates from deployed vSpace Pro servers. Administrators may define a device template with all settings and configurations, then clone and push it to new devices. All can be centrally managed and provisioned by the IT admin with vSpace Pro, allowing control of hundreds of RX300 devices with just a few clicks. Users are always up-to-date with the latest technology. License RX300 comes with a perpetual software connection license for vSpace Pro software with support for vCAST Streaming technology and Dual Display (requires optional accessory). Use on VERDE VDI requires a valid VERDE user license.